The 52.1 metre motor yacht Gravitas, listed for sale by Michael Rafferty at Camper & Nicholsons, has had a $2.15 million price reduction. 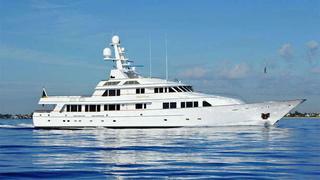 Built by Feadship to Lloyd’s class and launched in 1995, she was designed by the De Voogt Naval Architects studio. In 2014 she had a full repaint and a brand new interior in satin finished walnut paneling with designer soft goods. Accommodation is for 16 guests in eight luxurious cabins including an outstanding four-room master suite with a separate sitting room, office and breakfast bar. There are four further double suite and two twin cabins, all with en suite bathroom facilities. Conceived with worldwide cruising as a top priority, she has effortlessly logged more than 250,000 nautical miles to date and is ideally suited for both charter and private use anywhere in the world. Other features include a heli-pad, beach club and at anchor stabilisers. Available to view at the upcoming Palm Beach boat show, Gravitas is down from $22,000,000 to $19,850,000.